Depending on what exactly you want to copy, there are a few ways you can use to convert Excel table to a Word table. This is an Excel table we are going to use. There are background color and conditional formatting. 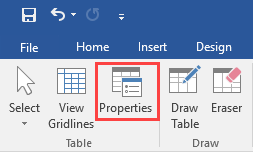 The easiest way to copy an Excel table to Word is to select all table cells in Excel (A1:F5), copy these cells (Ctrl + C) and paste them (Ctrl + V) to Word. Standard Excel pasting can be sufficient for some people, but Word gives you more control over pasting methods. Let’s see which of these methods you can use to achieve the desired effect. 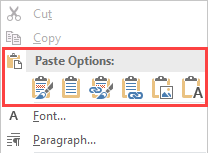 Instead of using a keyboard shortcut to paste the table, use the right mouse button inside your document to insert the table. If you use the second position, called Use Destination Styles (S), it will insert a table with row and column lines, but without formatting. So far, we pasted table as values, but we can also paste is as an image. 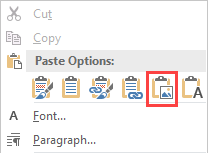 Right-click inside a document and choose the second position from the right. 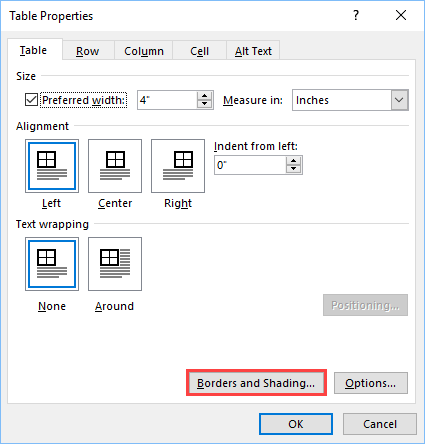 It will paste the table as an image, so you won’t be able to edit data inside it. If you want to keep table formatting, but also want to have borders, you can absolutely do it. First, paste table with Ctrl + V. Click inside the table and choose TableTools >> Layout >> Table >> Properties. From the new window choose the Table tab and click the Borders and Shading button. 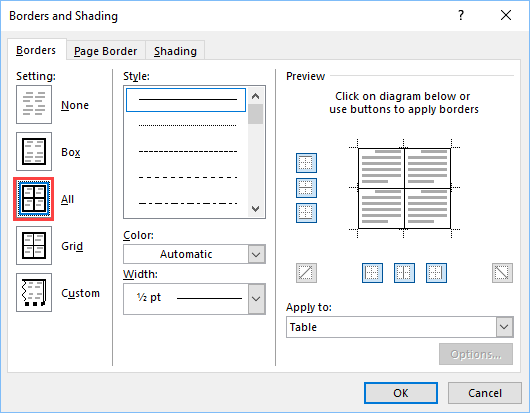 From the Borders and Shading Window, under the Setting, choose All. It will add borders and keep the formatting intact. You can also change color to make them similar to the table inside Excel.